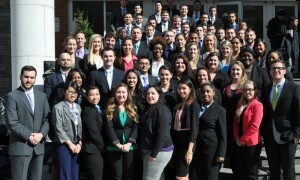 Seniors at Temple University's School of Tourism and Hospitality have the unique opportunity of joining "Montague-Ridall Associates" during their final semester. This course involves real world business experience that challenges students to think in new and innovative ways. Montague-Ridall and Associates aims to foster the development of young professionals through sustainable initiatives that strive to make a global impact. No matter the scale of these impacts, it is our mission to enhance the quality of life for all of our stakeholders, including our employees, our local community, and the world at large. Through our collaboration with the “Water Project” as well as local community organizations, we strive to aid in other’s sustainable growth while also shaping the professional growth of our members. Please help us reach these goals by donating to our Water Project Page! Every donation counts, thank you! 05/02/14 Blake Skversky $23.00 I Know that this money is going to help save a life!!!!! 05/02/14 Thilo Kunkel $92.00 Thanks for last-minute tickets. 04/23/14 Lisa Brown $23.00 Go Derek! 04/14/14 Dan Pulse $23.00 HUMAN RESOURCES! 04/10/14 Hana Kim $10.00 It's not much, but it's a start! :) Good luck!